What about the plugin WP Rocket Footer JS ? This plugin process all inline and external JS to one file, not multiple, and put at the footer with async on and put all localized scripts together before the primary script above. It also automatically optimize popular 3rd party services. You can download the plugin at the WordPress Repository here. It´s definitely not a well known plugin and so far downloaded just +1.000 times, not a lot compared to the number of WP Rocket users The plugin starts functioning as soon as you activate it. After activiting the Plugin, clear the WP Rocket cache, preload it and test the results. 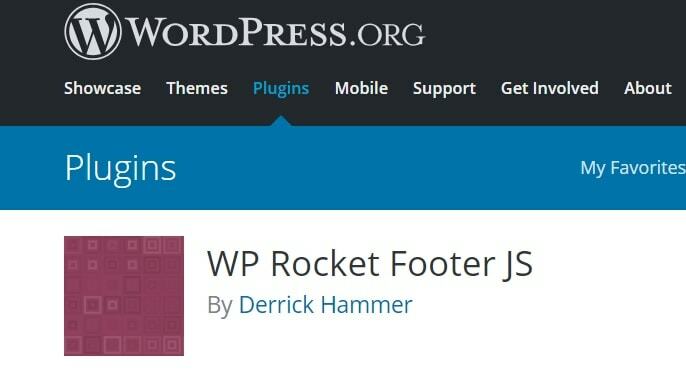 Conclusion of WP Rocket with WP Rocket Footer JS Plugin. At first sight it seems that WP Rocket with the extra Footer JS Plugin did a slightly better job. The loading speed was a bit slower (0.2 second), but the GT Metrics scores where better with the plugin. It scores 99% Pagespeed score and 96% YSlow score. But taking a closer look, besides the higher Metrics, the way of loading some pages with the extra plugin was a bit “funny”. There is a delay in the first part, obvious a result of placing all the JS in the footer. It could certainly annoy visitors. Above that, it took 0.2 second longer to load. Not much, but when it comes to speed optimizing, quit important for me. My conclusion, it isn´t good enough to add this extra plugin in addition of WP Rocket as it can also generate new problems and it does not improve the most important factor; Load time. note: I only did fast global testing, didn´t play with advanced settings in WP Rocket; just installed and activated the WP Rocket Footer JS Plugin. Therefore this test is a personal experience related to one specific website.